When I was 15, the house two doors up was purchased and soon, there was a rotating cast of black-clad, buff men coming and going. Ex-FBI Director James Comey's family and mine had both lived along the border of two towns, each of us on one side. After his appointment as director, his detail moved into the nearest house for sale and I made some new friends. Because of my experience with his detail (they liked blueberry muffins, couldn't come for Thanksgiving, and gave me a patch right before I moved in exchange for the baked goods I would bring them), I always saw Comey as a good man, albeit pretty naively. During the months leading up to the election in 2016, however, my opinion of him soured when I as a strong-willed Hillary supporter believed he was playing too intensely for Trump's team. After November, though, it became increasingly clear that Comey had made his decisions to discuss, conclude, reopen, re-conclude the Clinton email investigation for moral and non-partisan reasons. My view of him turned more sympathetic and forgiving, returning back to the friendly feelings for my surrogate neighbor. After reading "A Higher Loyalty" (and the Department of Justice Inspector General's most recent report), my perception of Comey has not changed: Comey acknowledges publicly that he made errors in handling the Clinton investigation and those errors helped Trump get elected. Most importantly, it is clear the decision was not politically driven nor did he intend for the consequences that arose. However, and I mean this from the sincerest place in my heart: the man cannot write a book. The stories he told were entertaining, thoughtful, and chosen to be impactful. But it was clear from the very first page that Comey did not rely on a ghostwriter for any part of his narrative. With that said, I was easily engrossed by the book and would recommend to any weary member of today's American society. Just as he himself acknowledges, James Comey is not a perfect person. But in the grand scheme of things (and in the much smaller scheme of comparing his leadership directly to Trump's), he is a good one. While I've never been subtle or quiet about my political beliefs or my stance on Trump, I have remained fairly quiet online and on social media regarding my positions. As we've progressed further into his tenure as president, I've noticed that although his words, policies, and executive decisions have become arguably more erratic and divisive, Americans have seemed to grow more tired and the fight against ignorance and intolerance has wavered a bit. It seems today that even though more troubling stories have arisen, we have grown numb and the most we can work ourselves up to is to say, "Trump is wrong." I myself have fallen into this trend as there's a lot of things I've stopped myself from saying for fear of starting a fight. We are in an age where if two or more individuals disagree on literally anything, the result is a fight, not a discussion. I can go on an write out all of these opinions I have, but that will take away from the message Comey intended to send with his book: "What is happening now is not normal. It is not fake news. It is not okay." Most notably, we can't get lost in the headlines and forget what Special Counsel Robert Mueller's investigation was established to look into: the focus, despite the frequent cries that it is a partisan witch-hunt, is not on Trump or Trump's collusion with Russia. Rather, Mueller was called to look into how an aggressive and often enemy foreign body influenced the 2016 Election and what the extent of that influence was. It is a known fact that Russia interfered with the election; Trump and his campaign's collusion is speculatory as of now. Thus, just as the investigation into Clinton's emails was necessary, so is the investigation into Russia's involvement in our democratic elections. After experiencing firsthand the damage provoking and partisan headlines can induce, Comey's argument (and what we should all take away from not only his book but Trump's administration) is that we need to sift between all of the opinions and the headlines and look at the facts that lay before us in the current state of this union. ***As I'm writing this, I have to acknowledge that news is coming to light about Comey's actions during 2016 and the lasting effects it has had on the FBI. 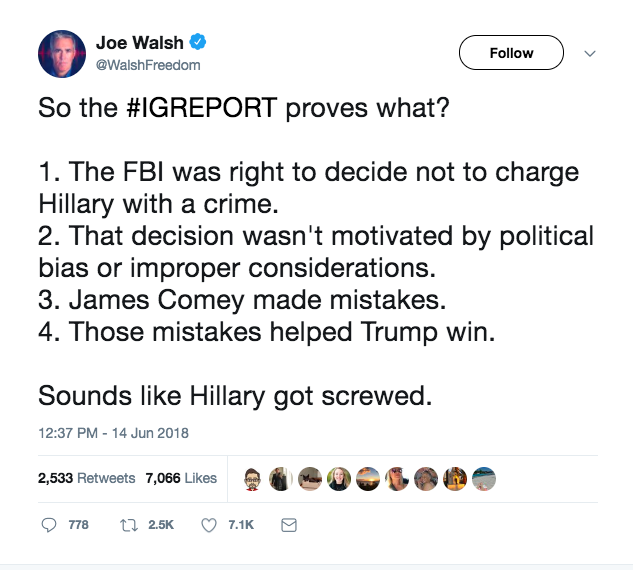 For the time being, my opinion of James Comey remains and hopefully it is not proven incorrect.